The DX13S Three-Phase split air conditioner uses the chlorine-free refrigerant R-410A and offers operating sound levels that are among the best in the heating and cooling business. An additional advantage for commercial installations is the base pan, which is raised to provide excellent water drainage and to help keep the coil away from debris that can accumulate inside the unit. 13.0 SEER Performance Service Valves with Sweat Connections and Easy-Access Gauge Ports Factory-Installed, Steel-Cased Filter Drier,The DX11S Commercial Air Conditioner uses the chlorine-free refrigerant R-410A. The cabinet features a powder-paint finish over heavy-gauge galvanized steel that provides premium durability and improved UV protection. The unit's attractive louvered metal guard protects the coil from damage and strengthens the unit. 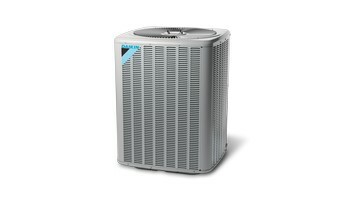 Unitary products provide high performance and energy efficiency at an affordable price.Both cooling only and heat pump type heating/cooling units are available for total home solutions that include air handlers, A-coils, and gas/electric furnaces.Advanced design including the condenser fan system provides quiet operation to both interior and exterior environments.An extensive range of options including air handlers, A-coils, and gas/electric furnaces provide customized solutions to any home interior environment.